We paid them a visit three years ago (The secret of Lightweight wheels). 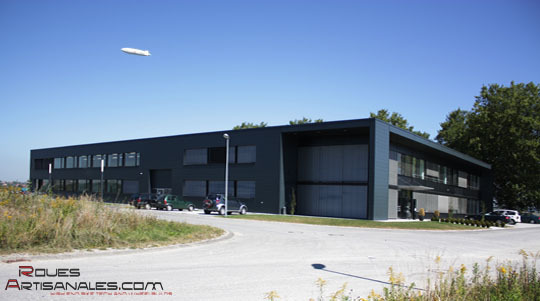 Carbon-Sports, subsidiary of Carbo-Fibre Tec, has knows an outstanding success. Originally, the exclusive and exceptionnal Lightweight wheels were made, in the ninetees, by Heinz Obermayer and Dierl Rudolf in a rustic workshop. In 2000, Erhard Wissler, investor and owner of seven international companies continued their work. Distributed in almost every countries, Carbon-Sports even sponsored professionnal teams such as Unibet, Canyon, then Milram through a higher production, the brand now stands as THE reference. 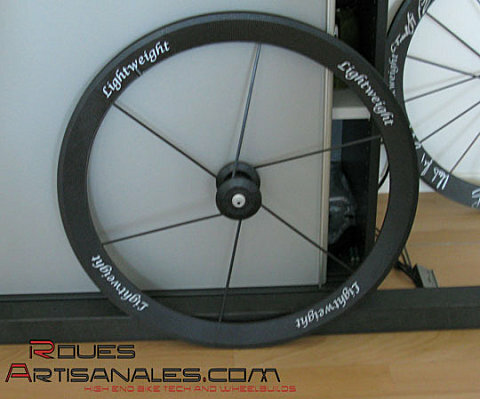 Lightweight wheels took another dimension, entered a new era. Today, Carbo-fibre Tec is a 150 employees factory. Erhard invested into a new production tool: a factory that is four times the area of the previous one. The Lightweight wheels represent nearly the half of the annual gross sales, what a jump forward ! The second half is coming from very different application fields such as medical, aeronautics, aerospace as well as racing cars components. The factory taking place very close to the Messe – the huge Eurobike site – presents all the signs of a quick success and the modernism coming along with it. Thus, the factory has been raised with the ecology in mind.We didn’t see any solar nor wind plant but a well thought system recovering the hot gazes coming from the carbon components « cooking ». 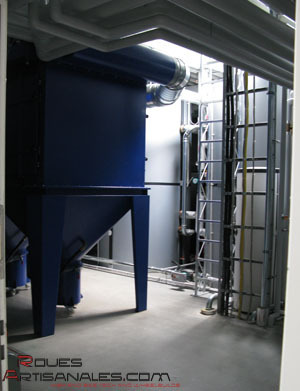 Carbo-Fibre Tec perfectly adapted its investment to its activities. Even before entering the building, and at the entrance, we had a good idea of the outstanding level of technology we were going to see there. 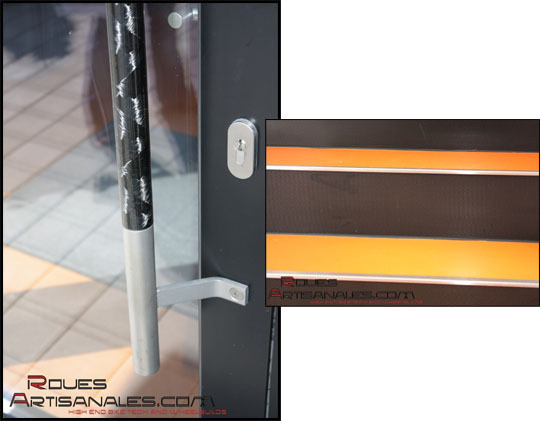 Indeed the main door handle and the steps were made out of carbon ! These touches make the difference! 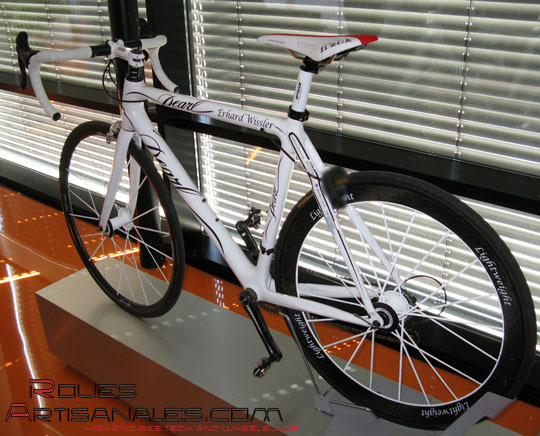 Featured at the entrance, Erhard’s bikes preview german technology and unveil a new component Carbon-Sports is currently working on. A full carbon caliper should hit the market soon or late. Probably expected for the next fair trades. The brake still is under development though, its shape will be modified. We won’t show it in details as it still is a prototype and we were told to keep it silent. Anyway you can have a first look at it on the picture below. Carbo-Tec carbon fibre components feature a structural foam under the visible carbon. This increases the strength and stiffness of the whole while maintaining a low weight. 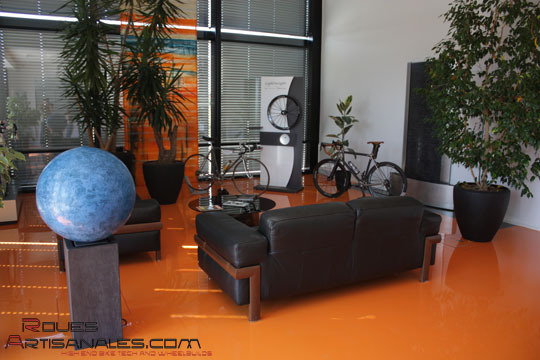 The carbon fibers are all kept cooled in a freezer in order to keep their properties. When the foam skeletons have been wrapped with carbon, the parts are put in their mold under a very high pressure during several hours. The ovens are sometimes very long, we saw ovens up to 10 meters long. The wheel making department is what stunned us the most. 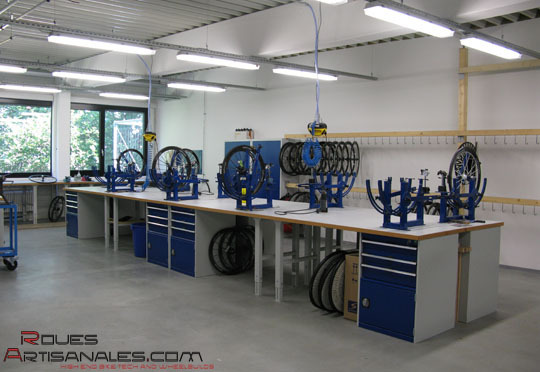 We will call this room the « area 51 » of Lightweight factory. We obviously have not been able to take any picture of this area, the competitors from europe, america and especially from asia would have been too happy! 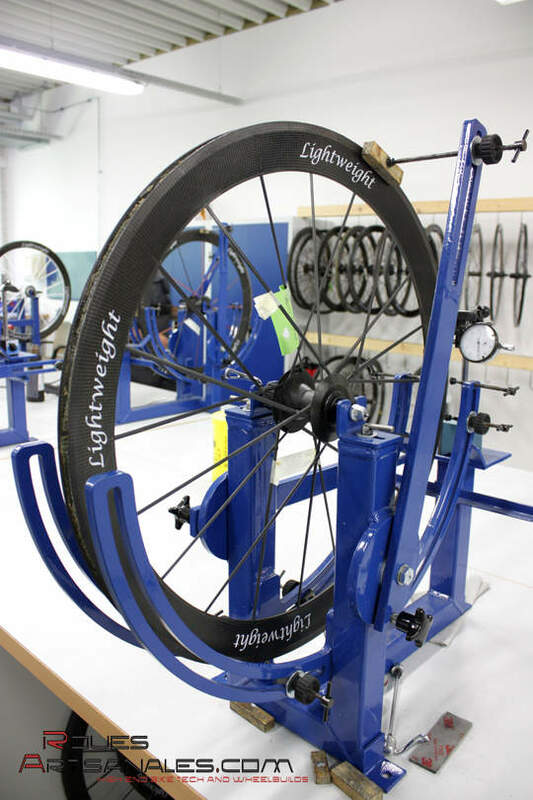 Although we don’t have any picture to show you, we can briefly explain how a Lightweight is made. 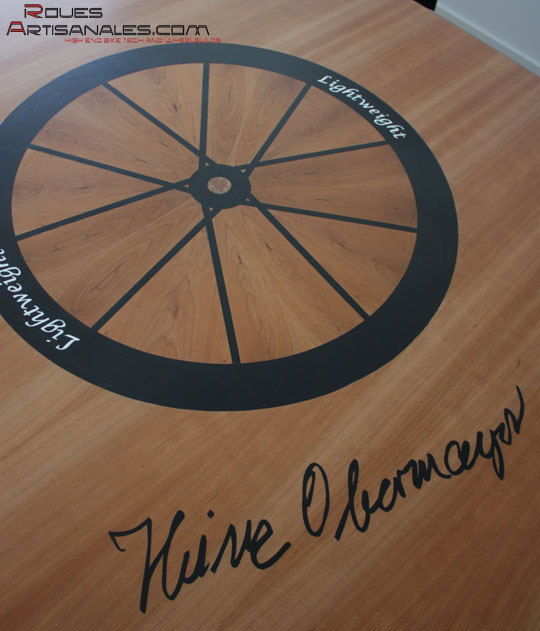 Basically, the carbon fibers of one side of the wheels are placed in a mold, the spokes are wrapped around the hub then tight with an extreme strength through thumb wheels. This procedure is similar for the opposite side, while the foam structure takes place in between. 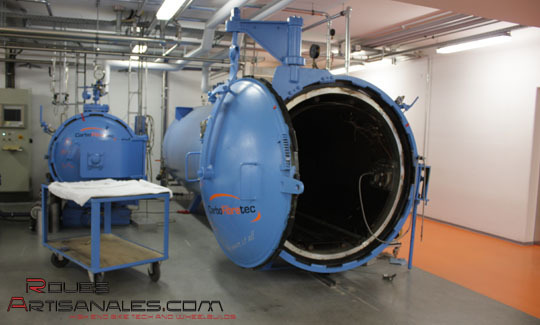 The whole receives pressure and heat from an oven, then the paint, sanding and truings finish are all set by hand. Regarding the clincher version, the manufacturing seems different, it looks like it’s made in several parts fixed together with strength to ensure the pressure and impact resistance of the rim. Truings and repairs are performed in a different room. The wheels are usually very true when leaving the mold. If they aren’t, they could be trued on a special truing stand. The post production truings are made possible while warming up the rim to put it straight again. 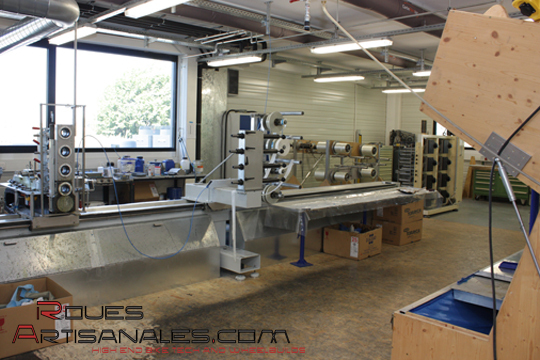 Lightweight team also performs tests both for quality control and development of their next products. and high price tag. It looks like the brake calipers may see the light the next year too. 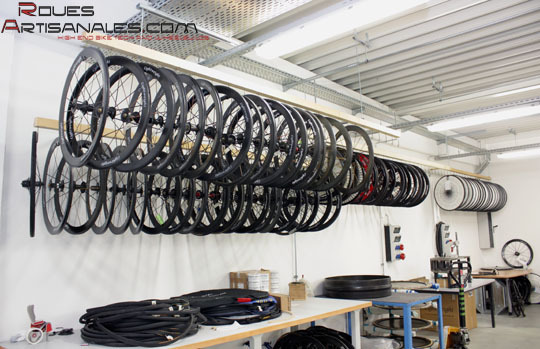 Finally, when considering the standard thirty-five hours of work per week of a french worker, a Lightweight wheelset almost represents one week of work for a worker! 28 hours to be crystal clear.